In a bowl, mix all of the ingredients except the chickens. Set the chickens breast sides up on a rimmed baking sheet. Flatten the birds, fold the wing tips under and arrange the thighs next to the breasts. Make 2 slashes in the breasts and 1 slash in the legs and thighs. Rub with the marinade, cover and refrigerate for 8 hours or overnight. Bring to room temperature before grilling. Light a grill. Cover 2 bricks with foil. Grill the chickens breast sides down, pressed with the bricks, over moderate heat until browned, 15 minutes. Flip and grill over low heat until the juices run clear when a thigh is pierced, about 25 minutes longer. Transfer the chickens to a carving board to rest for 10 minutes. Carve and serve, passing the chimichurri at the table. 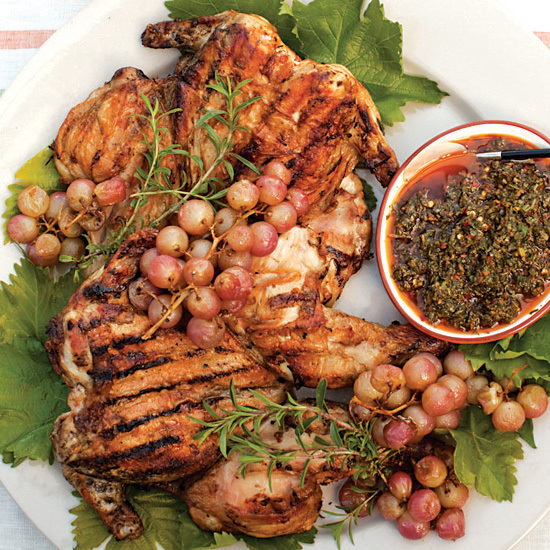 This spiced chicken goes well with a medium-bodied red like Sangiovese.